WHO WERE THE PRUSAI ? So far science has not been able to provide answers to this question, but it does not mean that we should not begin to put forward hypotheses and give rise to a constructive resolution of this puzzle. Great help in determining the ethnic origin of Prusai people comes from a new branch of science - genetics. Heraldically descendants of the Prusai, and persons unaware of their Prusai ethnic roots , when subject to the genetic test, provided a knowledge of the genetic groups of their people. In conjunction with historical knowledge, this enabled a conclusive finding to be made and indicated the territory that was inhabited by them. The number of tests must be much larger in order to eliminate errors. Archaeological research and its findings are inconclusive and do not help to solve this question. The above map shows the XIII century territorial division of the Prusai people. The genetic tests done on persons with their Pomesanian origin provided results belonging to Haplogroup R1b1b2a1b and described as the Atlantic Group. The largest number of the people from this group, are today found between the Irish and Scottish Celts. Genetic age of this haplogroup is older than the Celt’s genetic, therefore defined as a proto Celtic. Pomerania (Poland’s Baltic coast) was inhabited by the Gothic people, their chronicler Kasiodor tells us that they were there from 1490 year B.C. 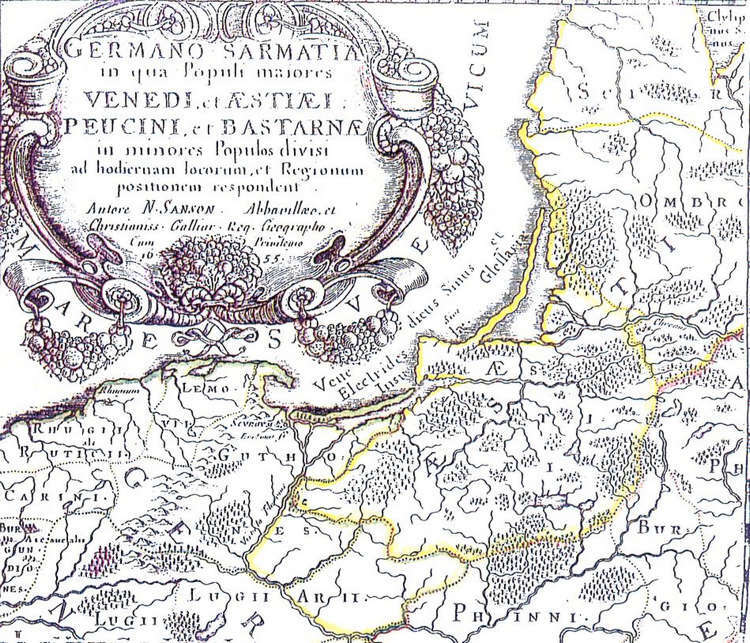 Around the III century A.D. its inhabitants, the Ostrogoths, migrated leaving at the upper-right side of the river Vistula a splinter group Gepedoios, Pomesanians. Archaeological excavations define Pomesania territory has being under the Wielbark culture influence . Their language which they used is a big unknown, traces of their dialect are preserved in the Elbling area. "Johannes Annius Viterbiensis says that first they called the Prussians Pruti, from Prutusa, king of the Scythians, the grandson of Noah. 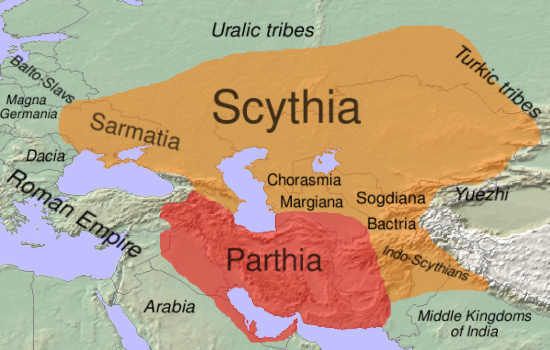 This nation is derived from the ancient Scythians, and this is likely: the other stuff we can not say anything more, "while accusing the author of cunning and others also who say that the "Prussians come from Asia, are under the leadership of Prussian King of Bithynia ". With this information we move to the preface with a mysterious map of 200 years B.C., appearing in the recent published history of the Prusai, "Where are you, Prusai?" by Lech Niekrasz, we may, with Mrs. Julia Dimitrov,s correspondence be able to explain more. Mrs. Juliet Dimitrov work "Готи, сиреч Гети" unfortunately is in the difficult Bulgarian language, explaining "Goths, is Getae"
Ms. Dimitrov writes, "The term Gothiscanza" (Goths habitat) is in itself very long and problematic. This is a verbal-constuction invented by scientists. Jordanes book to me is a very mystical and probably during the Middle Ages and the 30-year war changed in the interest of the winners in this terrible war - the Swedes. Whether the Goths were the ancestors of the Celts I can not say, I'm not an expert in this area, but I can say that the Celts were everywhere in Europe, also in the south. In Bulgaria, the Celts habitats found in the south of the country. But that's another topic. My studies are proving that the Goths they were descendants of the Thracian Getae. Just as the name in my book Goths, or Thracian Getae. Getae-one of the many nations in the ancient Thracian. Some of them migrated north in the days of Alexander the Great, Julius Caesar and Pompey the later part of Trajan. The Bulgarian chronicle of the thirteenth century, it is written that Getae had emigrated at the time of Alexander, the Bithynien, from the city Prusias, many of them to Baltic countries and later in the third-fourth century returned to Thracia. 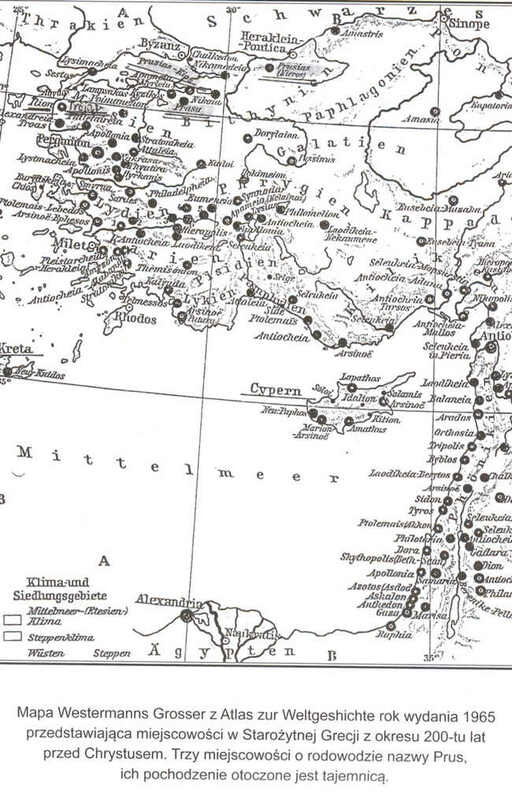 In this chronicle , the Bulgarians are known as Mysians and it is an area near Bythiniens on the map, which you sent me. This information is for the Bulgarian history. Ancient Bulgarians up to the 14th century were also called the Goths. It may sound for you strange and absurd, but it is true. Our history was 150 years ago, immediately after the liberation from the Turks, endlessly manipulated by the so-called victorious powers - Russia, Austrians, French and English. Because of this in the history books, we get to read that the Bulgarians were either "Turks" or "Salwen". The problem with the so-called "Slavs" (slaves) is also discussed in my book. And this is another politicized issue. I hope you believe me or not, I must say that the old Bulgarians-Getae have very much in common with people of Prussia and Lithuania. Old Bulgarians were called earlier Prussians, or Prussians from the Balkans. Of course I'm not talking about all Bulgarians, because at the time of history, many people have come here from different parts of the world. Tracologist during communism-socialism could not act impartially, but now prove the link between the old Thracian language, exist with Lithuanian and Prussian. A lot of place names and personal names hydronims can be combined with those of Thracians and the places in Prussia and Lithuania. I introduced these words in my book and dictionary words comparing the old Prussian with Bulgarian words. Thy have an amazing relationship. " Mrs. Julia continued, "I can only say that Samogetia (or also Samogitia) is the area where today Rusy - Russians are sitting. The name should be "Land der Geten, also der Gothen" - Country Geten, and so Gothen. 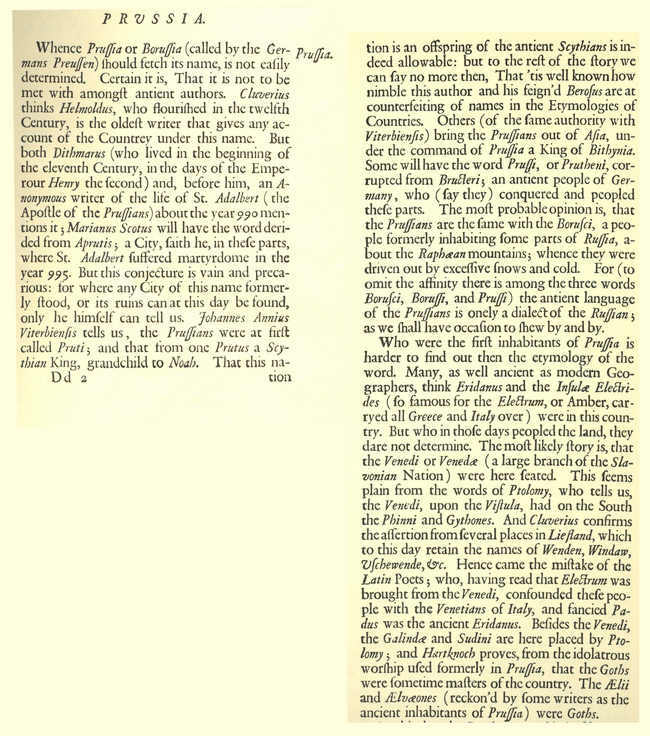 Prussian historian of the seventeenth century, Mathäus Prätorius and Christoph Hartknoch wrote about it. The authors are very curious, but unfortunately Praetorius hidden from the Germans. His book on the history of Prussia was published in Vilnius, 1999, translated from German into Lithuanian. Lithuanians respect his work very much, and approved the Prussian minority in Lithuania. The recognition of the minority by the Lithuanians leads to big problems in Germany. According to Jordanes Gepedoios should be part of the Goths, but here is the story of a very uncertain-probably much changed. " "Goths in the time of Christ believed in Zamolxis and is described by Herodotus, and here too there is a combination of Gothic and Thracians through faith. In my book occurs a whole chapter on faith of Thracian Goths. Zamolxis is the god of eternal renewal of nature, god of the earth, re-birth and ancestry. Praetorius says that God is in female form, worshiped in Prussia and Lithuania, and is known as Zameluks or Zamjol. Of course, they were in the old Prussian, or rather, Prusa, other gods as Perkun and Swaistikos / probably Swiatowid and others. " "My book is only available in Bulgarian, but it is also planned in the German language. Unfortunately the English edition is not planned and it is dependent on the interest of the book. I hope that my information will help you. " Historically, together with the archeology the Prusai of those lands could be proved as the homogeneous and oldest inhabitants in this part of Europe. The residents of Sambia the most densely populated, and adjacent territories to them Skalowii, Nadrowii, Natangii, Barcji and Warmia are of a proto Indo-European people with a genetic R1a1 Haplogroup. Looking at the below map from Wikipedia can be inferred that the missing Aesti (Sambs) are the Balto-Slavs people with the Sarmatian identity. At the beginning of our times the ancient historians like Ptolemy in Geography, III - 5.1. "European Sarmatia bounded on the north by the Sarmatian Ocean (Baltic Sea) along the Veneds bay (Bay of Gdansk, Sinus Venedicus)"
(Ibid., III-5.5): "Veneds Mountain (Οὐενεδικὰ ὄρη  / Venedici Montes)" (ibid., III-5.7-10): "great peoples inhabit Sarmatia: Weneds along the Gulf Venetic (Οὐενεδικὸν κόλπον) (. ..) The smaller the people sitting in Sarmatia Gythons near the river Vistula, below the Veneds (...) more to the east than those sitting below the Veneds: Galindians, Sudovians and Stawans till the Alans. " (Ibid., III-5.5): "Veneds Mountain (Οὐενεδικὰ ὄρη  / Venedici Montes)" (ibid., III-5.7-10): "great peoples inhabit Sarmatia: Weneds along the Gulf Venetic (Οὐενεδικὸν κόλπον) (. ..) The smaller the people sitting in Sarmatia Gythons near the river Vistula, below the Veneds (...) more to the east than those sitting below the Veneds: Galindians, Sudovians and Stawans till the Alans. " Aesti, sambian-Sarmatians as the above news could have come from the Black Sea between the eighth and fourth century BC. Map of the XVII century shows the ancient names "Aestiae" for Prusai land. Russian expert Smirnov writes, Scythian and Celtic peoples occupy a place in the history of civilization, just as the Greeks and Romans. According to Wikipedia, "The social Sarmatians organization was very similar to the Scythian. After a period of wars and conquests created a layer of the aristocracy, the representatives of which were buried in a richly endowed hillocks. A characteristic feature of social relations in the Sarmatian people’s community is the important role of women. Relatively large number of graves of armed men, especially in the western Sarmatians graveyards, shows some elements of matriarchy that survived from earlier periods. Herodotus says that early Sauromats , western Sarmatians - came from the compound of Scytians and Amazons. Noting the often discovered at Sambia mounds for dignitaries and faith in an afterlife, a significant role of women, allow to leave the interpretation of the relationships with the Sarmatians. 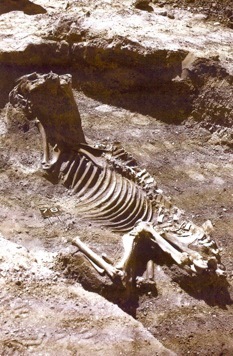 Often, the archaeologists are discovering the Prusai graves, frequent finding is the horse burial. According to the Russian archaeologist Kulakov, such burial is typical for the Sarmatians. Excavation of the former Prusai territory. The oldest Indo-European, today found also in the British Isles, Scandinavia and Spain. It is worth to mention, that in the 60-ties last century work in London was published "The vanished Civilizations", in a chapter written about Sarmatians by the distinguished Polish emigree archeologist prof. Sulimirski he reffered to Polish Sarmatians that some their coat of arms have Iranian’s symbols. This is a hint, that on their way to Baltic coast some dispersed and stayed in Poland, also he takes them very deep into history. Archeological culture, characteristic in the area known as a Baltick Culture. Their Baltic coast has a rich deposits of yellow amber, a well-known to the ancients in the Mediterranean basin. At the site of the port Wiskiauty, archeological findings remain not yet fully explained, carved trident on a granite stone, today a symbol of modern Ukraine. The archeological excavations are full of artefacts often derived from antique world including Arabia. All of this is dated to the first millennium Anno Domino. It should be noted that Sambian coast, repeatedly and unsuccessfully invaded by the Danes, was never mastered. The existence of Novogorod, the Rus ancient city when in its border had the Prussian street thus proving them being trade masters. The news of their fur trade with the Danes is common knowledge. Language of the region referred as the Western Balts language known also as the sambian dialect. The Galindians though well known to the ancient historians, suffered from a lack of any information. The great probability is that in support of the Vizygoths, in the V century they left their land together with Ostrogoths. The puzzle remains who they were, and there are two options, Goths or Sarmatians. They could have trekked away before the Slavs arrival, on the turn of fifth and sixth century. Nothing remains of the Galindian language. Most of what remains are legends about them. Contact with Spain R1a1 genetic test results strictly associated with Prusai, confirms some history knowledge. The Galindians with the Goths, after the collapse of their rule over the Romans had migrated to Spain. The name of Galind is not foreign there. 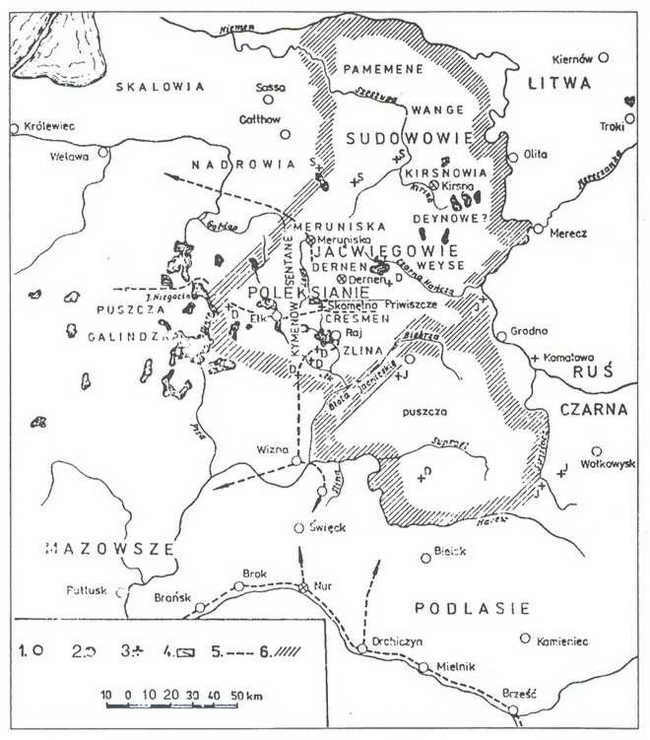 In the Prus land their territory was one of the largest, and during the Polish attempt of the conquest, and continous fighting with Jatviags all the riding routes led through their land, thus those remaining escaped to Barta land. These two hints are the only leads they might be with Aesti blood ties or otherwise Sarmatians. Sasins inhabited the present Lubawa land, and departed without sign, possibly when the Goths and Galindians trekked away. Unknown ethnic origin. The area described as under the Wielbark Culture influence. The very interesting test discovery of I2a2 Haplogroup. Could refer to the Neolithic times, in Europe this was a very rare population between the Indo-European settlement, they could survive the cold - ice age. Their Haplogroup I2a2, old European, genealogists put forward the idea that Europeans used their old European language, which affected all the Indo-European languages. They are completely unknown among us. Sudovia was known in the I-st century AD. Peoples of proto-Ugro Finnish arrived from Asia after the Mongol’s conquest by the Chinese people, and lived in the area of present-day European Russia. 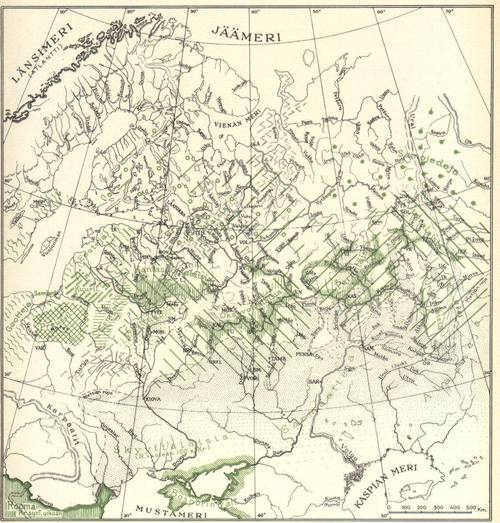 Their habitats in the north and the rest of were the hunting areas as shown in the following map of 400 Finnish th year. Genetic Haplogroup N1c1 with the origin of the early Ugro-Finn. They had their own language with several dialects. 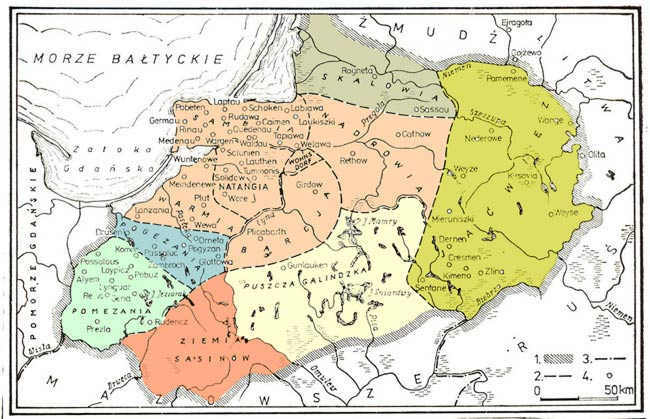 Divided into three clans, Sudovia, Dajnow and Poleksza. On their land, archaeologists found a number of fortified places. 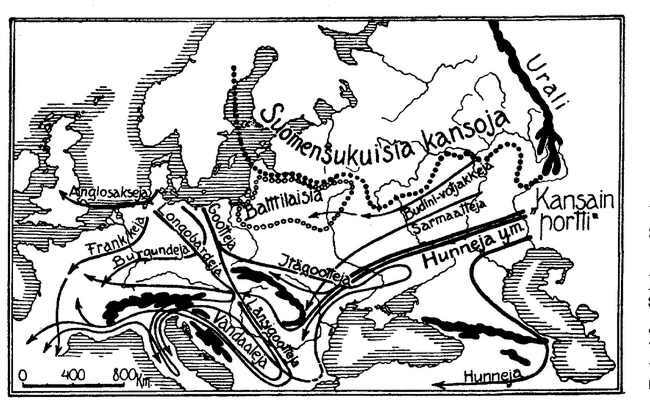 The map below prepared by Finns shows the Sudovian’s European migrations from the before of our times. The Ugro-Finnish peoples situation began to change rapidly, the reason being migration of the Slavs, completed around the VI century. Sudovians were driven to the north-west, noted in archeological excavations their presence was noted in and around the lake Sniardwy. Studies in these areas had not noted the prior presence of Sudovians. Remains of many fortifications, shows they were a very warlike people. At the end of the second Prusai uprising they appeared on the side of Prusai. Of their descendants today, many can be found in north-eastern Poland, Lithuania and Belarus in Grodno region. Sudovia lies in a forgotten corner of Europe, somewhere between the river Niemen and the Great Masurian Lakes. In the north reaches Romincka Forest, and Niemen valley Szeszupa in southern reaches of the river Narew, up to river Biebrza. In the west, includes the basin of the Leku (Elk) and Pisa, but rather Masurian Lakes does not reach, because there was Galindia already destroyed (in the XII century). Above Galindia borders with Barcia , Nadrowia, tiny Skalwia, east of Lithuania, from the south-west of Mazovia, to the south-east of Rus. The border with Mazovia and Rus (unlike its neighbors Balts), is rather conventional, and it is a buffer strip of ~ 100 km forest, in which no one dares to inhabit. Routes pass through here - rather wilderness, plundering expeditions and retaliatory raids. Excreted in Sudovia several major tribes among whom are Polexi (Poleksan of of river Lek - now Elk), Dajnowa and Sudowia (although they never called themselves). Map shows Sudovian's habitat area. The territory is divided into smaller land usually called the name of the nearest or most fortified place: Crasime (Krasime, Krasin), Eregalle (Ejragoła, Samogitia), Kirsau, Kymenau (Kimenow), Meruniske (today Mieruniszki), Pokim (Pokime) Selien (Zlin), Weyze (Wiżajny), Weyse (Wiejsieje). Some settlement only serve as a refuge in time of war, others are so great (as Mieruniske) that resides in the entire population lauksu (territorial community). All fortifiedplaces are more than hundred, some no longer used, they only have a defence meaning. Rarely occur above water settlement (island, peninsulas) connected to the mainland by a bridge, all the settlements lie in close proximity to water, even a small rill. Location castles always uses natural glacial hills here (pile-castle, kalnis-hill, pilekalnis-fortified hill), also hand worked where the hill was pretty steep, steepness of wood-topped earthen embankments. They are made so that the least amount of effort the hands and to cut off of the enemy defense access road space.